To other fishes they are rather peaceful but to fishes of their own kind they are very aggressive. A territory is made. The aquarium should be set up with driftwood, roots and stones because they need hiding places. In breeding time they dig a lot in the substrate and they eat plants, so plants can not be used. 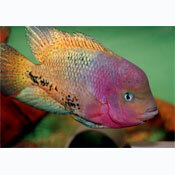 They are omnivorous so you should give them a great variety of live, frozen and dry food. A part of the food should be vegetable. Breeding only is possible with a good matching couple. The best way for a planned spawn is to raise a group of unrelated juveniles (6-8) to sexual maturity and allow them to pair off. The best pair should be chosen for breeding and other pairs should be removed. Up to 1000 eggs are laid and fertilized on a substrate. After 3-4 days the eggs hatch and another 3 days later the young fishes are swimming free. Both parents care for the fry very intensive. You can raise the young fishes with baby brine shrimp and fine crushed dry food. Adult males are brighter than females and tend to develop a slight nuchal hump. Males also have more flowing finage than females.